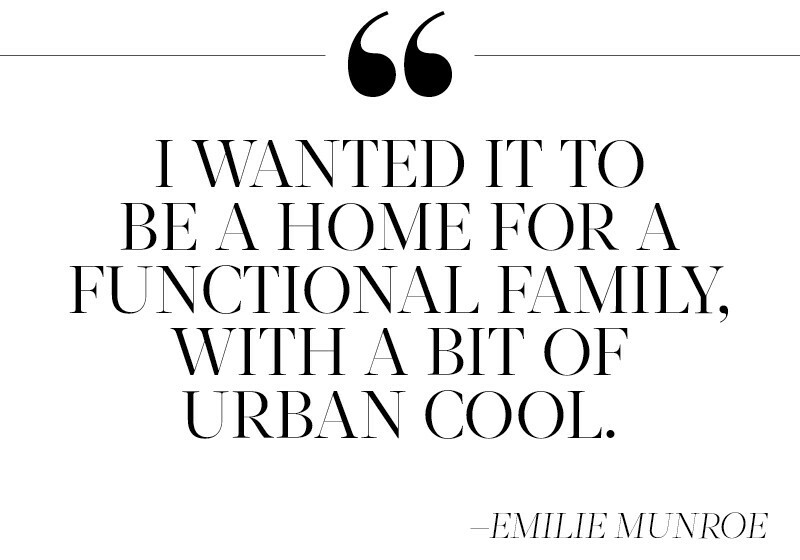 Designer Emilie Munroe proves that a stylish household can be an attainable luxury—even with little ones running around. A sun-filled living room in Greenbae, California, designed by Emilie Munroe. Photography by Thomas Kuoh. When describing a home as "kid-friendly," it’s easy to jump to conclusions that the look within may abandon style altogether in favor of utilitarian form. One Bay Area designer is trying to change that thought. "A family home has to be a home for both kids and parents," says designer Emilie Munroe, who applied this not-so-groundbreaking, but often compromised, philosophy to a growing family’s home in Marin County, just a few miles north of San Francisco. "Like for all young families, functionality, livability, and warmth were key design goals," says Munroe, "but the family also embodies a hip, urban sensibility, so I knew each space needed hip touches to match their energy and style." "You have to be a peple person," says Munroe on being a designer, "more than an artist or a business woman." In the living room, Munroe plays incorporates different textures and finishes to appeal to the senses. Munroe is no stranger to the design scene. 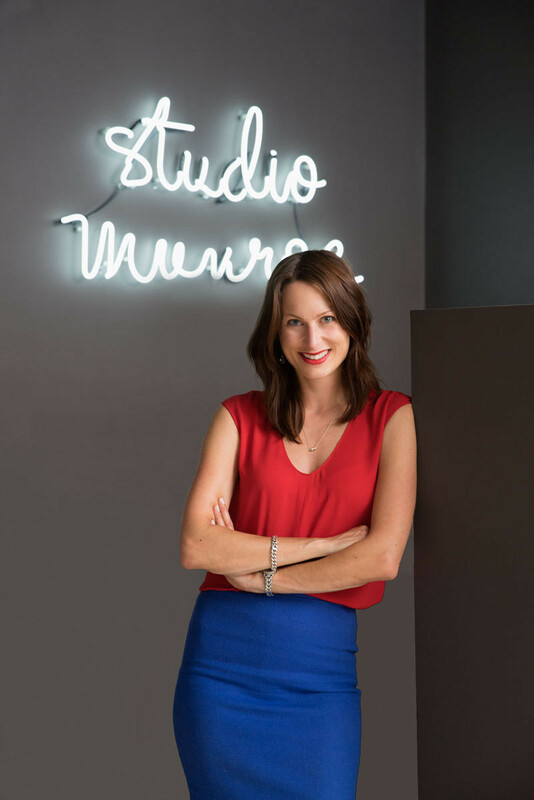 In 2013 she founded her own firm, Studio Munroe, after working under celebrated designer Jay Jeffers for nearly seven years. 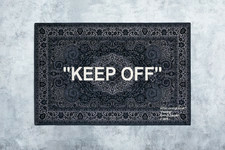 "You will not see one specific aesthetic in our portfolio," assures Munroe. "Our signature is less about a specific aesthetic and more about cultivating a feeling," she says, which explains why you won't here Munroe referring to Pinterest-happy words like rustic and modern. Setting out to strike a balance between both "kid-proof and adult-ready" design with comfort-inducing vibes, her client’s grownup tastes were not to be overshadowed by the family's younger inhabitants. Their major asks? "Tons of covered storage," says Munroe, "and elements of unique and cool in each room." The three-bedroom home offers up the relaxed sensibility that California is credited for mastering. The living room, with views of the Marin Hills, embodies Munroe’s practical-meets-stylish approach. A frenzy of pillows nestled on the deep sofas offer up cushy spots for both adults and little ones to cozy up. "When children are involved, accommodating and supporting play is a key component in the design process," says Munroe, who admits it was tricky to put a light-colored rug on the floor, so she stain-treated the rugs to prevent fretting over future spills. One area that they didn't have to worry about child-proofing, however, was the art on the walls. Flanking either side of the fireplace, black-and-white photographs of London graffiti found on Etsy hang above a rustic fire log installation, bringing that urban touch that Munroe so consciously strived to tap into. A custom piece of artwork by Tescia Seufferlein is one of Munroe's favorite elements in the room. "The artist guided our clients through a detailed process of inspiration research and sampling prior to the creation of the final product." The result? A piece that will surely stay in the family for quite some time. 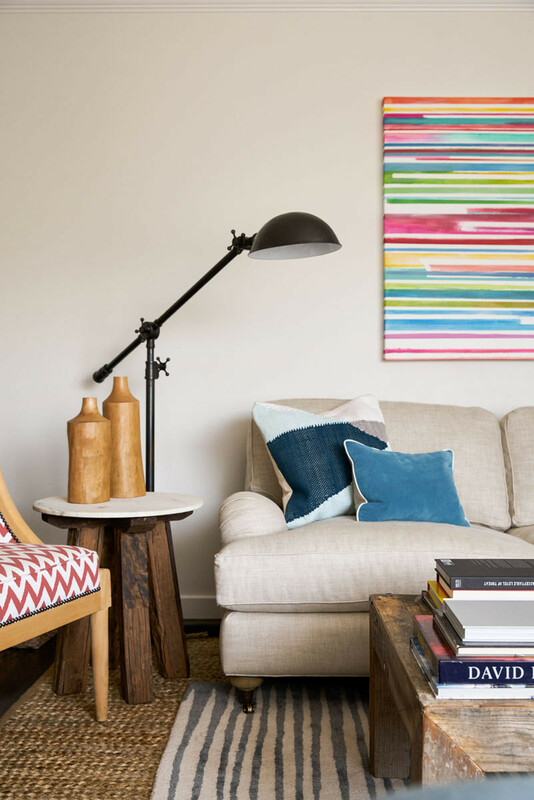 Though an overall netural color palette dominates the main living space, colorful art and patterned textiles prevent the room from feeling stagnant. Shades of coral and turquoise weave into the peaceful master suite. Subtle industrial and contemporary furnishings, like the corner desk and the curvacious blue side table, counter the home's organic tendencies. Seufferlein's bold art can also be found in the master bedroom upstairs. A triptych of descending graphic lines punctuate the room's encompassing grasscloth-covered walls—a strategic, edgy element in a rather serene space. "There is nothing like a client who is clear about their needs and also trusts in the design process," raves Munroe, who embraced the couple's existing Restoration Hardware bedroom furniture with its "traditional detailing, carved feet, and nailhead detailing" and played to its style, bringing in soft tones in the way of crisp drapery, dreamy soft linens, and a natural, woven floor covering. 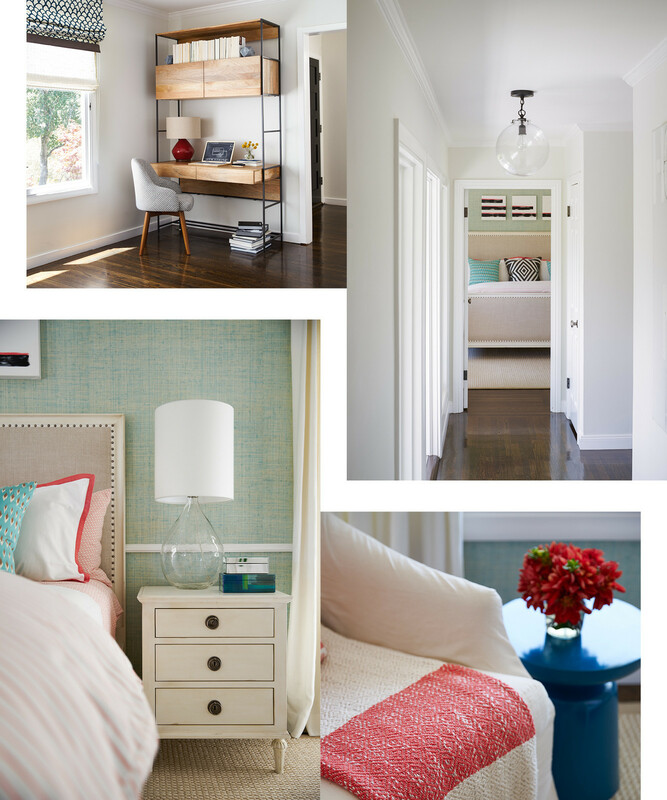 The master bedroom is a serene oasis to unwind and relax for the parents of two young boys. Where the designer played it safe in the master, she dug into her bag of tricks when it came to designing the sons' rooms. During the remodel, the eldest son transitioned into a new "big boy" room that was once the guestroom, while the couple's newborn son took over the preexisting nursery. "Along with this move, one of the client's dreams was to add a playroom space to the home for the boys as they grew older," says Munroe, who transformed the large room into an all-in-one toddler's room, playroom, and guestroom. "It was quite the puzzle," says Munroe, "and ultimately the room in the home for which I am most proud." The room required a hefty amount of strategic thought—from the functional daybed that can sleep visiting guests, to the groovy, custom-designed palm tree wallpaper that covers the walls. A firm believer in children's rooms with lasting design power, Munroe is confident the papered walls "will grow from playful to cool as the boys grow older." 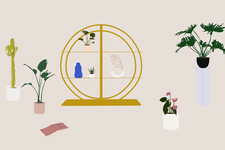 The nursery also saw its fair share of bold surface choices, this time painting the ceiling an icy blue—a move she had to sell to her quick decision-making clients. Admitting that the accent wall may be a little passé, the accent ceiling is an expected feast for the eye. "We like each space to be bright and warm with touches of playfulness throughout. This is why we enjoy family spaces so much." Throughout both children's rooms, miniature versions of in vogue modern furniture, like the white Panton chairs and the Eames rocker, lend a definite cool kid vibe. When it came to bold wall and floor coverings, Munroe saw these surfaces as the perfect place to make a bold statement.